On open space 100 yards from the beach (200 by road), “A Sea-Nic Escape” has wide ocean views right from the living room. 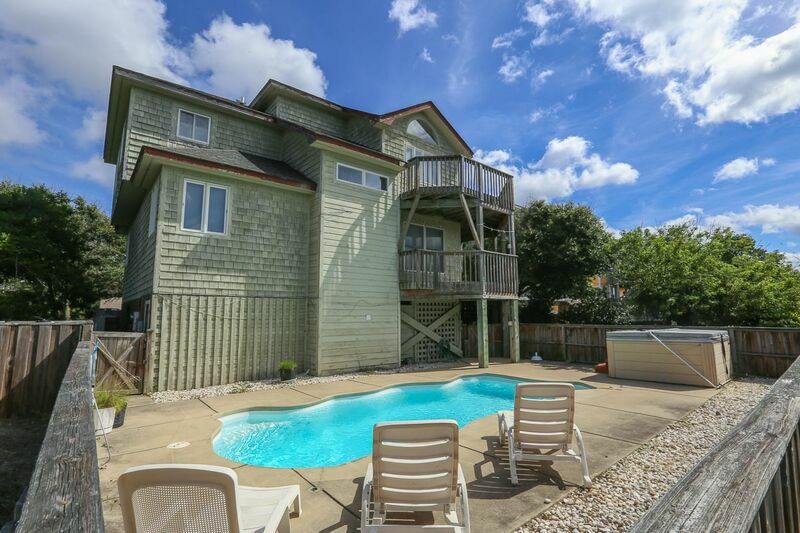 A PRIVATE POOL and HOT TUB, and tons of family, dog, and beach gear make your vacation fun and easy. One block to tennis and COMMUNITY POOL with great KIDDIE POOL. 4 bedrooms (bedroom/den with Daybed with Trundle, CATV, DVD player, PlayStation; 1 with Queen with CATV, deck access and dune views; 1 with Queen with CATV, deck access and semi-private bath; 1 with Twins with semi-private bath). 2 baths (1 with shower, 1 with large jacuzzi tub), deck. Master bedroom (with Queen and full bath). Great room with Queen sleep sofa and ocean views over open dunes. Dining room, well-stocked kitchen, half bath, and deck with comfortable furnishings.